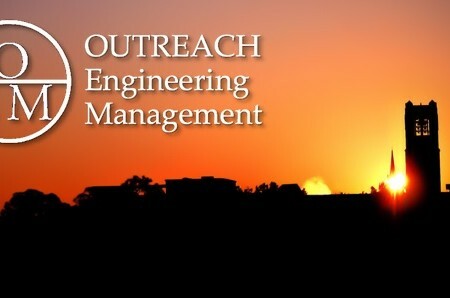 The University of Florida offers an Engineering Management master’s degree program in an outreach format for full-time working professionals. Students meet only one weekend per month for 20 months, taking five engineering and five business courses. Classes begin in August, and will meet in Orlando. The program awards an MS degree in Industrial & Systems Engineering (Engineering Management track). UF faculty travel from campus in Gainesville to teach. For many students, OEM is a solution to the problem of whether to get a technical master’s degree or an MBA. Students who want to get both degrees can do so by taking advantage of a concurrent degree option which requires only 12 additional months of study (32 months total). Application deadlines for the program beginning August 2014 are: first round application deadline – March 19, 2014; second application deadline – June 3, 2014. Interested individuals are invited to learn more about OEM by attending one of our upcoming open houses or info sessions that will be held in Melbourne (Melbourne Hilton Rialto, 2/5/14), Jacksonville (River City Brewing Company, 2/6/14), Orlando (UF Research & Academic Center, 2/22/14), and Tampa (Chart House Tampa, 3/4/14). We also have two online info sessions scheduled for 2/11/14 and 3/6/14. For more details about these sessions or the program in general, or to be added to the OEM email distribution list to receive future announcements such as these, please contact the OEM office (800.321.0199 or oemprogram@ise.ufl.edu) or visit the OEM web site, which includes complete application materials.